Infectious diseases are one of the major causes of morbidity and mortality in children in developing and underdeveloped countries. 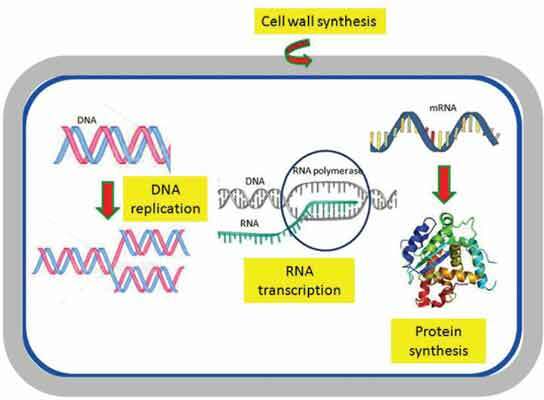 Limited knowledge of targets (cell wall synthesis, replication, transcription, protein synthesis) for antibiotics and lack of novel antibiotics have lead to an emergence of different level of resistance in bacterial pathogens. Multidrug resistance is the phenomenon by which the bacteria exerts resistance against the two or more structurally unrelated drugs/antibiotics. A common goal in the post-genomic era is to identify novel targets/drugs for various life threatening bacterial pathogens. Nanoparticles are broadly defined as submicron colloidal particles of size less than 1μm. Nanoparticles of size less than 100nm are the most promising warheads to overcome microbial drug resistance because they can act as antibacterial/antibiotic modulating agents at the site of infection and may have more than one mode of action. These nanoparticles will be of immense help in transporting drugs directly at the infected sites. Thus prevent drug resistance development to a great extent. In this review, the key mechanisms of resistance in bacterial superbugs have been discussed as well as how nanoparticles can overcome them. It is hypothesized that the nanoparticles can overcome the drug resistance via a novel mechanism of action. Additionaly, nanopaticles may also work synergistically with antibiotics via increased uptake, decreased efflux and inhibition of biofilm formation. The degradation by metallo beta lactamases and synthesis of porins may also be facilitated through these nanoparticles. Infectious diseases, Bacteria, Drug resistance, MDR, Superbugs, Nanoparticles. Department and School of Environmental Science, Babasaheb Bhimrao Ambedkar Central University, Vidya Vihar, Rae Bareli Road, Lucknow-226025., Medicinal Chemistry Department, Central Institute of Medicinal and Aromatic Plants (CSIR-CIMAP), P.O.- CIMAP, Lucknow–226015, India.